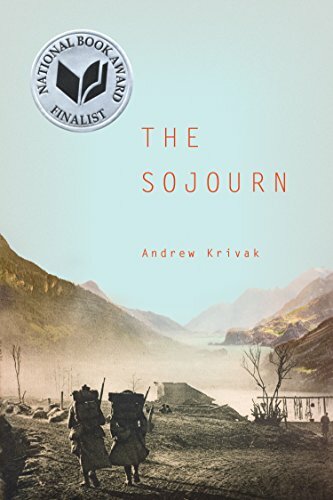 Primarily a World War One story, but also a coming-of-age novel and a tale about fathers and sons and brothers, Andrew Krivak’s well-researched and well-told tale, The Sojourn, is a valuable contribution to World War I literature. Inspired by his grandfather’s experiences fighting for the Austro-Hungarian army in the First World War and his experiences in Czechoslovakia and America, Mr. Krivak creates a compelling war story. Except for the Prologue, which recounts the tragic circumstances of the narrator’s early days, The Sojourn is narrated by Jozef, who, as an old man, relates his experiences as a boy returning, in 1916, to a village in the Hungarian Empire from America. Jozef recounts his experiences living in the small village of Pastvina with his father, stepmother, stepbrothers, and later his adopted brother, Zlee, hunting in the mountains with his father and Zlee, operating as a sharpshooter with Zlee on the southern front in World War I, and trying to return home and establish a life after the war. For the most part, the writing in The Sojourn is spare and lean, making Jozef a credible narrator of a memoir-like novel. The work also follows in the tradition of a Hemingwayesque style of war writing. Jozef describes the Sturmtruppen of the Armeeoberkomando: “They drilled in separate units, and although their uniforms never matched a single shade of Austrian field gray, their steps did, so that from the distance that Zlee and I often observed them, they appeared a flock of disparate-feathered doves who nevertheless clung in flight to a formation that bolted forward in an instant, left or right, without a single frayed or lagging edge.” The accounts tend to be concrete and not particularly lyrical but effective and strong. Immediately following this section Jozef explains: “They say the earth is a soldier’s mother when the shells begin to fall, and she is, at first, your instinct not to run, but to dig and hold and hug as much of that earth as you possibly can, down, down, down into the dirt, with your fingertips, hands, arms, chest, thighs, and feet, until you are like a child clinging with his entire body to comfort after a nightmare.” The narrator uses some beautiful details but, as in most of the novel, is not introspective or analytical. Because The Sojourn traces Jozef’s experiences from early childhood to young adulthood, it seems like a coming-of-age novel. However, although the narrator comes-of-age in his story, the work is not really a bildungsroman in that it includes little delineation or analysis of Jozef’s psychological, moral, or social development. Consequently, The Sojourn is most powerful as a war story and least effective in its more sentimental sections toward the end when the war is over and Jozef meets a Gypsy girl. The detached prose doesn’t work as well in relating a domestic setting as it does for battle scenes. The Sojourn could be effective as a series of three novellas or one longer, more developed and extended novel divided into sections about: Jozef’s infancy in America and his relationship with his father there and in Pastvina; Jozef’s war experiences; and, finally, Jozef’s experiences after the war and the new life he creates for himself. The opening and closing sections of the novel pale by comparison to Mr. Krivak’s masterful story of Jozef’s experiences in World War I.